It is truly a testament to my boredom that I'm making a shoe blog post. I used to love wearing high heels because they really gave a boost to my mood but ever since I became a mom flats have been an integral part of my life. Still, I do wear high heels when I'm on a date with hubby or when I'm meeting friends and not bringing the kiddo along. 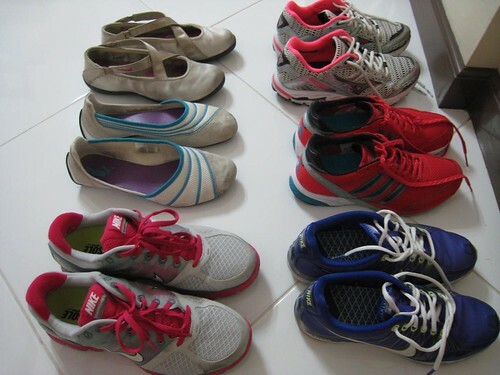 Clockwise from upper right: Mizuno running shoes, Adidas AdiZero running shoes, Nike Sister One running shoes, Nike LunarElite running shoes, Puma slip on rubber shoes and Nike rubber ballet flats. When I worked in Makati I used to go the gym regularly. That explains my collection of running shoes. The other rubberized shoes just looked too cute and were very comfy so I got them. My favorite running shoes right now are my Mizuno shoes and the AdiZero shoes. I have done a 5k in the Mizuno shoes but am trying to get accustomed to a flatter sole hence the AdiZero shoes. The Nike shoes I take out every so often but I am using them more as sneakers than actual running shoes. My feet ached the first few times I was using the Nike LunarElites so I wanted to sell them but no buyers so they stayed with me. They've actually gotten better with use so maybe they just needed to be broken in. I consider this my Anthology collection. It started with the black banana flats that were super comfy. I used it all the time and even had it resoled. I found myself wanting other colors and then trying on the different styles. One thing I love about the brand is that the shoes are ultra comfy! I'm now saving up for the NYC wedge bootie. 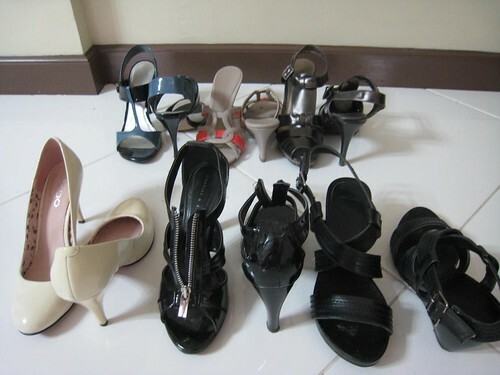 I'm a big fan of Charles & Keith since they have a lot of styles at a very affordable price point. The problem is that you can't expect them to last for years. The leather will get thin and the slightest scuff will cause it to tear. The Aldo shoes I picked up from the outlet store. The Matthew sandals I got on sale from CMG. I used to have more but due to wear and tear they have been given away. Hmm.. I think I forgot to take a picture of a pair of brogues, Ichigo flats and another pair of pink heels. My Pluey rain boots. Oh well.